We like you. That’s why we make it easy (and delicious) for you to rack up Rewards points. It's simple: sign up, eat and earn. Spend $1, earn five points. When you reach 750 points, bank $10 in your Rewards account. There's no limit to how much you can earn, or eat. Our favorite fans get super-exclusive perks, too. Download our brand new rewards app! 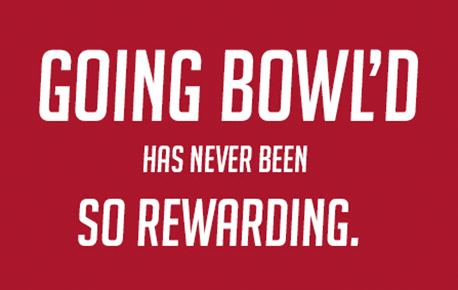 Once you’re a Rewards member, you’ll earn just by eating at Genghis. But here's a secret perk: on Mondays, you’ll earn double the points for every dollar you spend. ARE KHAN’S REWARDS AND GENGHIS REWARDS DIFFERENT? Khan’s Rewards became Genghis Rewards in January 2019. Genghis Grill transitioned to this new rewards platform in order to better serve our loyal guests. Khan’s Rewards members will not lose previously earned rewards. One exciting feature of our new Genghis Rewards program is our new Rewards app. This is the easiest and most convenient way to track and redeem your rewards. The Genghis Grill Rewards app is available for download from either app store. IF I WAS PREVIOUSLY ENROLLED IN KHAN’S REWARDS, WHAT SHOULD I DO NOW TO CONTINUE TO PARTICIPATE IN THE REWARDS PROGRAM? The easiest way to update and migrate your account to the new system is to download the Genghis Grill Rewards app. The second way to migrate your account is to visit GenghisGrill.com and sign into your account by clicking on the “Sign In” tab in the top right corner of our homepage. WHY AM I BEING ASKED TO UPDATE MY ACCOUNT IF NONE OF MY INFORMATION HAS CHANGED? Protecting your enrollment information is a top priority for us. In order to move your information to the new Rewards program a one-time update is necessary. HOW DOES GENGHIS REWARDS WORK? Receive 5 points for every $1 you spend. * At 750 points, you will receive a $10 reward, which expires in 60 days. When you sign up you will receive a Free Appetizer or Dessert special offer, which expires in 30 days. You will also receive a birthday reward the week of your birthday, news and special offers. *Alcoholic beverages are not included in eligible purchases to earn reward points. HOW DO I CHECK THE BALANCE ON MY GENGHIS REWARDS ACCOUNT? You can check two different ways. 1. Visit GenghisGrill.com Sign into your account by clicking on the Sign In/Register tab on the top right corner Click on the Rewards Member tab that appears next to your name. Below you will see your banked rewards reflected in a $ amount as well as a message stating how many points you are away from earning your next reward. Keep in mind when you reach the 750 point mark, those points will convert into a banked $10 Reward. 2. Open the Genghis Rewards App Tap Rewards at the bottom of your screen. This will display how many points you have accumulated towards your next reward. If you have a banked Reward this amount will appear below in the red Redeem button. HOW DO I ADD THE POINTS FROM A PREVIOUS VISIT ONTO MY GENGHIS REWARDS ACCOUNT? Using the Genghis Rewards app, after each visit simply scan the barcode at the bottom of your receipt or enter the barcode number to receive your points. Please note that receipts must be scanned within four hours following each visit before the barcode expires. If you have not downloaded the app, make sure that you give your server your email address or phone number that is linked with your Rewards account when you arrive so that your server can ensure that you are credited. If for some reason you are not properly credited with your points or you encounter technical difficulties please contact us at rewards@genghisgrill.com. I HAVE TWO GENGHIS REWARDS ACCOUNTS, HOW DO I MERGE THEM TOGETHER? Please email rewards@genghisgrill.com and provide us with all of the email address(s) that you have used previously and which email address you would prefer to keep for your Rewards account. We will then merge those accounts for you. WHAT OFFER WILL I RECEIVE FOR MY BIRTHDAY REWARD, AND WHEN WILL I RECEIVE IT? If you have visited Genghis Grill 4 or more times in the 12 months preceding your birthday, you will receive a free Birthday Bow. If you have visited Genghis Grill less than 4 times in the 12 months preceding your birthday, you will receive a free appetizer or dessert. You will receive you Birthday Rewards 7 days prior to your birthday. The Birthday Reward is valid for 14 days from receipt. CAN I EARN OR REDEEM REWARDS WITH ONLINE ORDERS? Absolutely! Sign into your account when placing online orders and you will be able to apply redeemable Rewards and earn points. CAN I ADD MORE THAN ONE USER TO MY GENGHIS REWARDS ACCOUNT? We currently only allow one user per account. The user must be 14 years old or older.